I have been so busy I barely have had time to eat! I returned from Asia only last week and had to quickly adjust to time and work back in Wooster. Now I am getting ready to lead a team to the Amazon in Brazil. We leave in nine days. Yesterday, I was the guest speaker at another church and I wanted to share the message I shared with that congregation. they gave me the topic — parenting and family. I chose to speak on the lessons God teaches us through children. I share it with you so you can feel a little bit of my heart. It will be a three-part series. Hope you enjoy it. 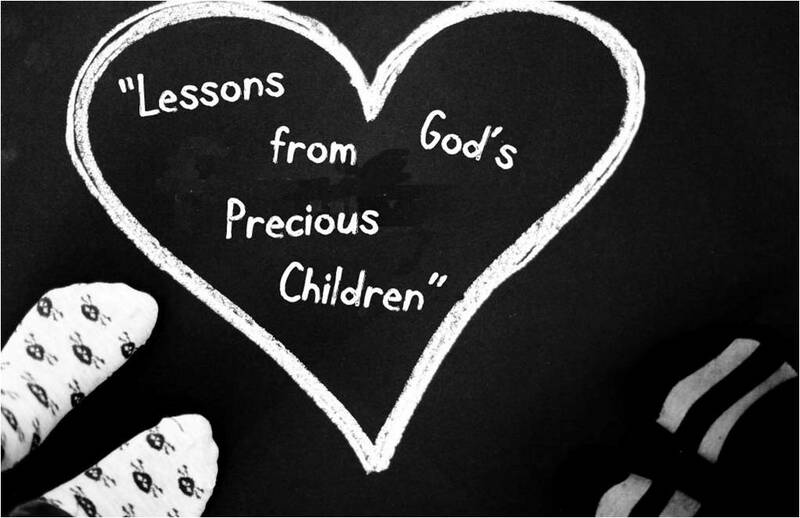 three lessons He taught us through God’s precious children and they are all found in the Gospel of Matthew. “Then people brought little children to Jesus for him to place his hands on them and pray for them. But the disciples rebuked them. Jesus said, ‘Let the little children come to me, and do not hinder them, for the kingdom of heaven belongs to such as these.’” (Matthew 19:13-14). Let’s face it; children can be a handful sometimes. My youngest daughter, Carissa, when she was a baby, she was always into everything. Her hands were like little weapons of mass destruction. She could be smiling at you while her hands were doing havoc behind her back. When she was a toddler, she was a handful at church, never sitting still, never listening to anyone. More than once I had to take her outside and read the Miranda rights to her. One time I was speaking and she was being particularly difficult. I apologized to my people and said, “I gotta take my daughter outside and have a little talk with her.” I grabbed her; put her on my arms, and started marching out of the building. She was facing the opposite way, toward the people, and just before we left the building, she yelled: “Pray for me!” The whole place erupted in laughter. I mean, after that, what can you possibly do? I realize that keeping kids under control can be an impossible task at times. I just returned from SE Asia and while there I interviewed a couple for a job. They have an eighteen month old baby who was crying the whole time we talked. Needless to say, the interview didn’t go very well. Sometimes kids can be more than a distraction. They can be absolutely taxing and overwhelming. I can picture Jesus catching the commotion from the corner of his eyes as the disciples were trying to stop moms and dads from bringing their children to be blessed by Him. I can hear Him saying, “Guys, what are you doing? Stop that nonsense. Don’t mess with my precious children. It’s people like them that will keep me company in heaven.” And then he proceeded to take children on His lap and bless them… and all the other business was tabled! Don’t you love that? Jesus’ example shows us that He is a friend of children par excellence. And He wants us to go out of our way to love children, make them feel welcome, and never do anything that would block the path that leads children to Him. Jesus, in a way, was teaching us to come down to the level of the children, to have the worm’s eye view, so to speak, and not the bird’s eye view. By strongly contradicting the disciples and interrupting everything to bless the children, Jesus was showing us the supreme value of children in God’s eye, and if we want to honor God we have to see children the same way. The point is that many grown-ups have this default mode to always keep children on a short leash. But there are times when we just need to let children be children. We need to give them room, within reason, to mess things up for that’s what children do best. Speaking of prayer, ever since my children were born, I have prayed what I call the 3 P’s for them. 1. The first “P” is for protection (from the world, from the enemy of their souls and from themselves); 2. The second “P” is for purpose (I want my children to totally immerse themselves in the purpose of God for their lives. I don’t want them to rest until they find that purpose. And though I don’t want them to be miserable, until they find that purpose, I want them to be restless); 3. The third “P” is for a partner (think about this: there is a good chance that your children’s future partners are already living somewhere, people are shaping their lives, and decisions that will change them forever are being made). If you are not in the habit of praying the 3 P’s for your children, you should start that today. So, to recap, the first lesson God wants us to learn through His precious children is that we need to treat children as Jesus’ friends, not a burden. Tags: east and west, friendship, giving directions, laughing, living in the u.s., north and south, what i learned from living in the u.s.
Today, as I was driving to work, I started laughing at some of the things I learned because I live in the U.S. I learned to count distance in miles and weight in pounds. I learned where North, South, East and West are. Sure I had studied about it in school but it didn’t really apply to anything in my world. So you can imagine my shock when I went to a church and they told me to meet with the mission committee “at the northeast narthex and afterwards we are going to have lunch at the south fellowship hall toward where the southwest corner mission display is.” I never felt so dumb in my whole life and never felt like calling somebody “dumb” as much as I did that day! But today I was proudly reciting the turns I was making and which directions they were. I felt good. It was actually easier to remember east and west than it was to pronounce the names of the streets. Only in Wooster you have streets like “Bever” (pronounced like “beaver”) and “Beall” (pronounced like “bell”)! But that is not all. If I didn’t live in the U.S., I would probably never need to write one thank you card my whole life. No, we are not rude, we simply don’t write that kind of stuff. If people do something nice to us, we find a way to do something nice in return. No need to waste ink or paper. “Just do it.” But over the years, and especially now, in the age of instant feedback online, I am tickled when I get a personal handwritten note. I often post them somewhere publicly. I also try to write notes as often as I can and encourage my staff to do the same. Everyone thinks they deserve to be thanked for something. Why not indulge their fantasies? I also learned that it is okay to come to work and not socialize. When I started working in the U.S., say the first three months, I used to stop at my colleagues’ offices before my day started and would ask about what they did the day before, how their kids were doing, what kind of brand of coffee they preferred, etc. I should have gotten a hint when they didn’t invite me inside their office, but it took me a while to figure that one out. Whether you are truly working or not, it is imperative to APPEAR that you are — at any time. What about this one? I sudden leaky faucet one day. I didn’t know what to do, so I called a friend I had met who had been running with me. He politely answered but barely after I mentioned my problem, he said, “I can’t talk to you right now. I will call you a little later.” I was devastated. My concept of “friendship,” coming from Brazil, was that if a friend was in distress, you dropped everything and did whatever you could to help. And the more I learn, the more I need to rely on people’s graces to understand this foreign head of mine. Thank God that He made all of us the same. The gift of respecting the customs and beliefs of those who differ radically from us has to be a divine attribute.